Studies have shown that there is strong inertia in culture because values and beliefs are formed through intergenerational transmission. Much less is known about how culture changes, and which aspects of the changes in values and beliefs are permanent or temporary. This column examines the effects of the Cultural Revolution in China on urban elites, and reveals that the lack of access to higher education affected people’s beliefs throughout their life. Also, while the ‘lost generation’ passed down their greater mistrust in the government to their children, their changed beliefs on the roles of effort versus luck were transmitted to a much lesser degree. Fifty years ago, the Cultural Revolution in China was in full swing. China’s leader, Mao Zedong, wanted to eradicate all ‘bourgeois thinking’ and forced people to ‘remodel their world view’. In practice, this led to decade-long chaos. Parts of the government and the Chinese Communist Party (CCP) were paralysed, millions of cadres were demoted and denounced in mass trials. Competing groups of Red Guards fought each other. Ancient Chinese culture was denounced as counterrevolutionary and Red Guards destroyed large parts of the rich Chinese cultural patrimony: monuments, paintings, books, and so on. One aspect of the Cultural Revolution that was particularly salient for millions of people was the shutdown of the Chinese university system between 1966 and 1976. While some universities remained open during the Cultural Revolution, the standard curriculum was replaced by ‘revolutionary’ education. For example, traditional medicine was considered bourgeois and was abandoned in universities. Doctors were replaced by ‘barefoot doctors’ with a minimum education performing traditional Chinese medicine based on acupuncture. The Cultural Revolution ended abruptly with the death of Mao Zedong in October 1976. Members of the Gang of Four (which included Jiang Qing, Mao's wife) who had led the CCP during that period were immediately arrested after Mao's death. Among the first policies that were enacted immediately following the end of the Cultural Revolution was the reintroduction of the college entrance exam, Gaokao, in 1977 after a ten-year interruption. This ten-year lack of access to serious higher education among high school graduates generated what was called the ‘lost generation’ (e.g. Chen 2007). Members of the ‘lost generation’ who are now entering retirement age have expressed strong bitterness about their lost opportunities. In recent research, we exploit this episode to examine how particular life experiences, shaped by political turmoil outside of individual citizens’ control, may have affected their beliefs (Roland and Yang 2017). Using data from the baseline wave of China Family Panel Study (CFPS), a nationally representative survey conducted in 2010, we compare the beliefs and corresponding behaviours of high school graduates who did not go on to obtain university degrees versus those who did, focusing on the cohorts who graduated just before and just after the Cultural Revolution ended and college admission resumed. Many of the high school graduates born before the end of the Cultural Revolution never even tried for college admission, because they had already started jobs or even families, and it simply became too costly to go back to school. Had they been born just a year or two afterwards, they would not have experienced this interruption to their education schedule; they would have graduated from high school just in time to participate in the college admission exam. When we zoom in on this narrow window of cohorts who graduated from high school just before and just after the end of the Cultural Revolution, the exogenous loss of opportunity due to the suspension of higher education remains arguably the only difference between these neighbouring cohorts. How did the lack of normal access to higher education affect beliefs among the ‘lost generation’ compared to their counterparts a year or two younger? Figure 1 shows differences in beliefs between high school graduates who have gone on to college and those who have not, across different cohorts (1957, 1958, 1959, and 1960). Those born in 1959 and 1960 did not experience disruption in higher education, whereas those born in 1957 and 1958 did. These adjacent cohorts do not differ in terms of basic characteristics that we could collect (gender, ethnicity, biological traits, geographic location, parental educational attainment, and parental political status), suggesting a pseudo-regression discontinuity design. We find that high school graduates born in 1957 and 1958 and missed out on college education are significantly less likely to believe that effort pays off relative to luck, even well into their sixties. In addition, they hold persistent grudges against the government for these lost opportunities, as they report significantly higher distrust of the government compared to later cohorts. We thus find that the lack of access to higher education, due to being born in the ‘wrong’ years, affected people’s beliefs throughout their life. Interestingly, this is especially true among those who were unsatisfied with their current income as of 2010. It is not surprising to observe such persistent changes in beliefs. Adolescence and early adulthood are often considered to be formative years (or, impressionable years) in an individual's life; experiences during this period can induce effects that last for a lifetime. Equally interesting, we also find that parents only transmitted part of their changed beliefs to their children. 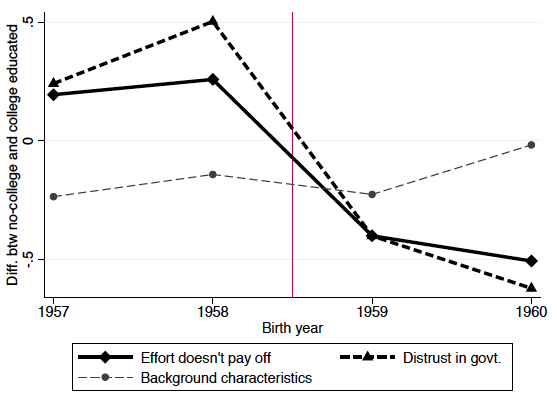 We find that while the ‘lost generation’ passed down the acquired larger mistrust towards the government to their children, their changed beliefs on the role of effort versus luck are transmitted to the next generation to a much lesser degree. In fact, the ‘lost generation’ parents who missed out on college education have been spending more on their children's education expenditures compared to their counterparts in the immediately younger cohorts, suggesting that parents aspired for their own children to have access to a higher education that was denied to them. This pattern of intragenerational persistence and intergenerational reversal suggests that when we study the endogenous formation of people's beliefs and preferences, it is important to distinguish between those that persist over time and are transmitted across generations, and those that only have a transitory character (for example, beliefs and preferences that are determined only by direct personal experiences but are not transmitted across generations). Whether given events and experiences lead to a persistent or a transitory change across generations has critical implications for the dynamic evolution of the corresponding beliefs and preferences. We still know very little about what make some changes in beliefs and values permanent or transitory. Our research on China’s ‘lost generation’ is a first step in that direction. Bisin, A and T Verdier (2001), “The Economics of Cultural Transmission and the Dynamics of Preferences,” Journal of Economic Theory 97, 298-319. Chen, Y (2007), “Lost in revolution and reform: The socioeconomic pains of China’s red guards generation, 1966–1996”, Journal of Contemporary China 8(21): 219–239. Roland, G and D Yang (2017), “China’s Lost Generation: Changes in Beliefs and their Intergenerational Transmission ”, CEPR Discussion Paper No. 12053.